I Never Quit is a documentary about the life of Terry Allen, more commonly known as Magnum TA. Directed by Michael Elliot, I Never Quit is another entry in a long line of excellent documentaries released by HighSpots. The film takes a look inside the life of one of the NWA’s hottest performers in the 1980’s and his life once his time in the ring was over. I recently watched I Never Quit and thought I’d share my impressions. The film dedicates just a couple of minutes to Magnum’s childhood and high school years before focusing on his wrestling days beginning in Portland and ending in Charlotte. If you are reading this blog, then I assume you know that Magnum TA was a rising star of the NWA in the 1980’s whose career was tragically cut short at the age of twenty-seven after a freak car accident. The film actually begins with Magnum revisiting the site of his car accident. I give major kudos to the filmmakers for not using filters or soft music to make the moment overly dramatic. You can tell Magnum is a man who is at rest with what happened and moved on with his life and I’m glad the film didn’t try to exploit that. I learned a lot that I did not know about Magnum’s wrestling career. I was just three years old when he had his accident, so obviously I didn’t see his rise to fame. I was unaware at how big of a star he was in Mid-South and the film features a great set of interviews (Jim Ross, Bill Apter, Dave Meltzer, Jimmy Valiant, Ricky Morton, and George South) who explain how impressive and influential he was. You can tell by the way they talk about Magnum that he was the real deal. It’s also easy to see that all of the interviewers have a great deal of respect not just for the wrestler Magnum TA, but for the man Terry Allen. The film looks great and when music is featured it is fitting and nice. 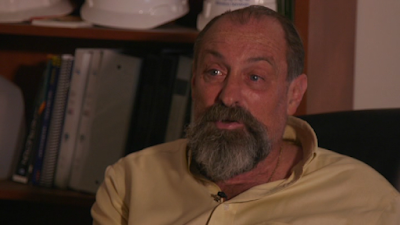 The filmmakers licensed footage from the Don Owen’s family library so that matches could be seen throughout the documentary. Sadly, they do get repeated quite often, and in many cases look like early fan cams (shot on film, not video.) 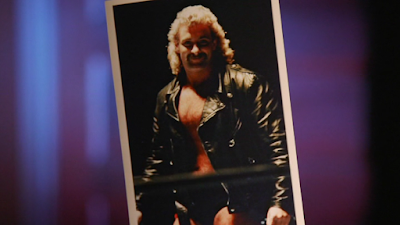 But considering the WWE owns all of the broadcast footage of Magnum’s career, it was pretty damn impressive that they managed to any film to feature. A single match against Ric Flair is also included on the DVD. My only real complaint with the film is a small one and that is about the font used throughout. For whatever reason, the filmmakers decided to try and get fancy with the font used to label the interviews and it’s difficult to read at times. Keeping it simple with an Arial or Times New Roman would have been an improvement over whatever it was they chose to use and wouldn’t have become a distraction. I Never Quit is the type of documentary you wish the WWE would make with a large budget and put on the Network. Unfortunately, Magnum never wrestled for Vince McMahon and that almost guarantee’s he’ll get no attention by the WWE. 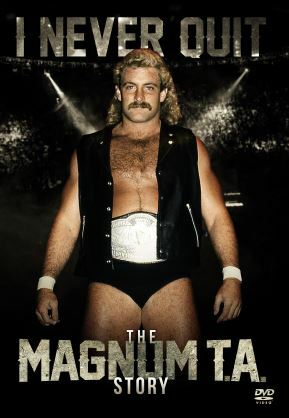 As much as I hate the WWE controlling everything, I almost wish the WWE would license these independent documentaries and air them on the Network so younger fans could be exposed to the story of Magnum and in return seek out his matches. I really enjoyed I Never Quit. I thought it was well made, had some great interviews, and told a fantastic story. Once the movie finishes, you can’t help but ask yourself, “What if the accident was only minor?” Would Magnum TA be a household name in 2017 and where would his success led him? Unfortunately, life is full of what if’s and this is just another one of them. 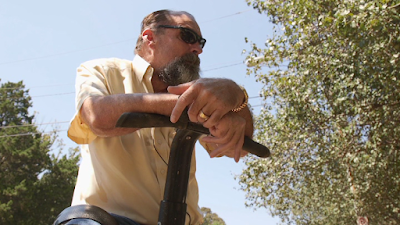 I Never Quit is an excellent celebration of the career and life of Magnum TA and any fan of wrestling owes it to both them self and Magnum to give it a watch. Husband, father of three, and lover of all things professional wrestling Michael is the founder of The Wrestling Insomniac and posts unique articles about wrestling, live event reports, and regular columns The Last Match and Signed Trading Cards. Brandon, a wrestling fan of over thirty years, enjoys all wrestling but spends most of his time watching classic Memphis and WCW matches. Brandon contributes live event reports, documentary/DVD reviews, and other assorted wrestling posts. Roy 's column Roy's Reviews focuses on reports from events he has attended and wrestling DVD's. 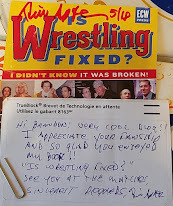 I grew up reading the Apter Mag's & now Mr. Apter has read my blog!